Five men have been condemned to death for their alleged activities during the 11-day uprising at the Southern Ohio Correctional Facility in April 1993. I believe that these men were selected for prosecution because they were leaders and spokespersons for the other prisoners. The five death-sentenced men are at different stages of the appeal procedure. James Were a.k.a. Namir Abdul Mateen had a second trial because his claims of mental incompetence and retardation were inadequately addressed in his first trial. He is directly appealing in state court a second conviction and death sentence. George Skatzes is at a later stage of state proceedings known as post-conviction review. The Court of Appeals took seven years to affirm his conviction and sentence on direct appeal. His petition for post-conviction review has been pending for three years. The other three convicted men -- Keith Lamar, Jason Robb, and Siddique Abdullah Hasan f.k.a. Carlos Sanders -- have reached habeas corpus proceedings in federal court. Keith and Jason are in the early stages of obtaining access to additional evidence, a judicial process known as "discovery." The magistrate considering Hasan's petition for habeas corpus recommended on August 14 that his petition be denied without further opportunity for discovery or an evidentiary hearing. This decision puts Hasan at the head of the line of the prisoners awaiting execution for Lucasville-related convictions. Objections to the Magistrate's Recommendations must be filed in the United States District Court by October 14. Hasan's lawyers have asked me to prepare an "amicus curiae" or friend of the court brief. What I present tonight is the gist of what will be in that brief . Briefly, I shall argue that Hasan deserves further discovery and an evidentiary hearing concerning two matters. First, there is overwhelming evidence that Officer Vallandingham was killed by Anthony Lavelle and two other members of a gang headed by Lavelle, the Black Gangster Disciples, not by Hasan and other Muslims. This evidence should provide a gateway to additional fact-finding. Second, the only evidence connecting Hasan to Officer Vallandingham's murder is testimony by a prisoner named Kenneth Law that the prosecution knew to be false when Law testified and that Law has since recanted. Discovery is urgently required to test the tentative conclusion that the prosecutor sponsored perjury. The Magistrate's Recommendations (hereinafter, "the Recommendations") recite verbatim the factual findings of the Ohio Supreme Court. Recommendations at 7-10, quoting State v. Sanders (2001), 92 Ohio St.3d 245, 245-247 . I am an historian as well as a lawyer. In my book about the Lucasville events I have set out the troubling manner in which Ohio state courts determine the alleged facts in a capital case. The jury makes no findings of fact. Yet when a case reaches the state Supreme Court, the Court typically presents an elaborate factual narrative at the beginning of its opinion. There are no citations to the record in these factual narratives. The Justices were not present during the defendant's trial, could not observe the demeanor of witnesses, and thus had little basis for evaluating witnesses' credibility. How did the Court decide who to believe? The Court does not explain how it weighed conflicting evidence in reaching its factual determinations. It is especially troubling that in so many of its determinations the Supreme Court relies on the testimony of a single witness. Graduate students in history and aspiring journalists are taught never to rely on information from a single source. In the Lucasville Five cases, the Court repeatedly relied on single witnesses. Let me give two examples from Hasan's trial. There was a meeting between Arthur Tate, warden of the Southern Ohio Correctional Facility (SOCF) in Lucasville, and Muslim prisoners on April 5, 1993. The meeting concerned the Warden's plan to conduct TB tests by injection under the skin, to which the Muslims objected because the substance to be injected contained phenol, a form of alcohol. The Supreme Court determined that Hasan said: "You do what you have to and we'll do what we have to do." Recommendations at 7. This determination was based on the testimony of Warden Tate: none of the other prison officials present at the meeting were asked to corroborate his testimony. During cross-examination, the Warden was confronted with evidence from his deposition testimony in another proceeding. Tate conceded that he had said it "very well may have" been another Muslim prisoner, Leroy Elmore, rather than Hasan, who said that if someone were to attempt to force him to submit to a test he would resist. State v. Sanders, Transcript (hereinafter, "Tr.") at 1305. Tate did not deny that he also said at the deposition that he did not recall Sanders (Hasan) giving him that same impression. Id. It is troubling that the Court credits the testimony of the prison warden, which, if it was true, could easily have been corroborated, and which was called into question by the warden himself in another proceeding. It is far more troubling when the Court credits testimony of single witnesses from a class of witnesses -- prisoner informants -- whose testimony is inherently unreliable and should have been considered suspect . For example, the Supreme Court determined that on "the night of April 14, around 9:00 or 10:00 p.m.," prisoner informant Miles Hogan heard George Skatzes, Stanley Cummings and Hasan discuss killing a guard. This entire patch of testimony should have been called into question by the fact that according to the State of Ohio's own Negotiation Tape #5 , Skatzes was negotiating on the telephone with prison representative Dave Burchett from 8:23 to 10:50 p.m. Furthermore, Negotiation Tape #5 ends with an agreement between Burchett and Skatzes that two hostage officers would be released in return for an opportunity for a prisoner representative to address the public by radio. It is manifestly unreasonable to suppose that Skatzes, painfully hammering out this understanding with Burchett, was simultaneously insisting (during a pause in the telephone negotiations?) on the necessity to kill a guard. It is equally unreasonable to suppose that three leaders of the rebellion would have held the conversation about which Hogan testified within earshot of Hogan and several other alleged prisoner snitches locked in L-6. See Tr. at 2085. The Supreme Court determined and the Magistrate adopts without comment the conclusion that Hasan "planned and led the takeover." Recommendations at 7-8. This supposed factual finding is consistent with the prosecution's repeated emphasis that this was Hasan's riot, undertaken to satisfy Hasan's ego, and that once the uprising was underway Hasan "reigned supreme . . . at all of these meetings." See Prosecutor's Opening Statement, Tr. at 1153-1154, 1180, 1191-1192, 1206; Prosecutor's Closing Statement, Tr. at 5052-5054. The trial judge assisted prosecutors in this strategy by three times instructing the jury that they could link Hasan with the misconduct of other prisoners by means of what he called "the Saran Wrap of complicity." Tr. at 5225, 5227, 5232. One might have hoped that somewhere in the approximately twenty-five thousand pages of trial transcripts relating to the Lucasville Five, defendants would have been allowed to offer some evidence as to why the April 1993 disturbance occurred. Even in a homicide arising from a barroom brawl, a criminal defendant is allowed to present evidence of provocation. This is especcially so if the defendant is convicted of murder and the trial reaches the second stage when the jury is asked to weigh aggravating and mitigating factors, and to make a recommendation as to whether death is an appropriate penalty. Hasan was not permitted to present evidence as to why the uprising occurred in either the guilt or sentencing phases of his trial. After Warden Tate testified, Hasan's counsel tried to cross-examine the warden about prison conditions that caused the rebellion. The trial court barred the question, ruling: "This is a murder case. It has nothing to do with a riot, except that it happened in a prison at the time of the riot." Tr. at 1398-1400, 1414. He's just going to criticize the administrator of prisons, and riots are not created by the prison. Riots are created by the inmates. Now I said before in this trial, it is not going to be a trial of a riot. What this is is a murder that happened to happen in a prison during a riot. Even so, evidence of how the uprising began seeped into the proceedings during the direct examination of prosecution witnesses. Muslim informant and prosecution witness Reginald Williams testified that there had been discussion of the impending TB test among Muslim prisoners on Saturday, April 10. Q. What was Hasan's advice in regards to the tuberculosis testing? What was he telling or advising his fellow Muslims to follow him to do? A. He only advised us of what he was advised from our scholars in South Africa, which was that the tuberculosis test was prohibited for us to take. Q. And did he tell you about any actions that they would take if these tests were attempted to be administered to you? A. He just said we would stand strong. He didn't make any allegations at that time, not that I recall, to no particular actions that we would take . . . . Even the next afternoon, Sunday, April 11, the "takeover" was envisioned as a means of protecting Muslim prisoners from forcible injection by officers the next day. A number of Muslims met on the recreation yard in the early afternoon, according to Williams. After a 5-10 minute prayer there was a discussion. Q. And what was the discussion about? A. The discussion was about the administration was going to lock down the institution Monday . . . . Arthur Tate had basically designated his officers to come around and force us to take this tuberculosis test. Q. And what did Hasan say you guys were going to do in response to that? A. . . . I feel like he was doing his obligation as a Muslim was to protect us, you know, and his obligations were to do everything that he can to assure that the community was safe. And being down in S.O.C.F., guards are known for excessive force on inmates. So we decided -- Hasan decided that we were going to basically barricade ourselves in L-6 until we can get someone from Columbus to discuss this -- us being forced to take this test without them having no consideration of our religious belief. Q. You're saying the plan was to have a brief barricade in order to bring attention to the fact that religious beliefs were being trounced upon? Thus the action contemplated by Hasan and fellow Muslims was characterized even by this prosecution witness as brief, essentially defensive, and intended to catch the attention of prison administrators in Columbus who had authority to overrule Warden Tate. Surely, had the defense been permitted to supplement this evidence with the testimony of Mr. Rowan and others, it might have affected at least the jury's decision to recommend a death sentence. The most serious inadequacies in the Magistrate's Recommendations arise not from mechanically repeating the factual findings of the Ohio Supreme Court, but from rejecting significant new evidence of Hasan's actual innocence. In its evaluation of Hasan's Eighth Ground for Relief, the Recommendations state that: 1. All this new evidence was originally presented in Hasan's petition for post-conviction relief; 2. The evidence was "uncross-examined"; 3. None of the affidavits have been authenticated. Recommendations at 42. Insofar as the new evidence concerns Anthony Lavelle's role as the actual killer of Officer Vallandingham, it derives largely from my book. Therein I based what I said on evidence presented under oath and subject to cross-examination in the various Lucasville trials, in each case citing the relevant page or pages of the trial transcript. If the Magistrate's reason for rejecting this evidence has to do with the form in which the evidence was brought to his attention, I have all the transcripts and would be happy to file with the Court the complete examination and cross-examination of each of the relevant witnesses, should that be desired. Hasan's purported responsibility for Officer Vallandingham's death derives from evidence concerning two episodes: a meeting of leaders of the uprising on the morning of April 15, and the hands-on strangulation of the officer at about 10:30 later that morning. The Ohio Supreme Court determined that a meeting of gang leaders was held on Thursday morning, April 15, ending approximately two hours before Officer Vallandingham's murder. The FBI had installed recording devices under the occupied cell block, and there exists a tape recording (Tunnel Tape 61) of a meeting alleged to have occurred between 8 and 9 a.m. Hasan did not chair the meeting, and Hasan apparently did not speak at the meeting. Moreover, Tunnel Tape 61 was neither played nor made part of the record in State v. Sanders, see Recommendations at 48-49, and the jury was obliged to infer what happened at this meeting from the testimony of prisoner informants who claimed to have been present. We hadn't made a clear decision. I had told them, you know, that we should decide on what we're going to do but we need to come back after the deadline and make sure that this is what we want to do. So I said, you know, after we give them a deadline, if they don't meet it we should come back together and decide, you know, whether we want to do this or not. Q. So then the agreement was that he would not be killed without another meeting? A. That's correct. . . . I state, let's meet back up here later at another time, after we give them this 2:30, 3:30, whatever, and we decide, okay, they haven't met our demands, they had until such and such a time, they haven't met it, are we going to do it. Yes or no. Everybody said that's a good idea. In the absence of evidence incriminating Hasan in Tunnel Tape 61, the question of whether Hasan had any connection with the death of Officer Vallandingham comes down to the circumstances surrounding the hands-on murder of the officer. Hasan has presented substantial evidence that Lavelle himself, in a rogue action later on the morning of April 15, caused the hostage officer to be killed. Recommendations at 42-43 characterize this evidence as "unreliable." Recommendations at 44 assert that the proffered evidence concerns only "inconsistencies in the relevant witnesses' testimonies in the various Lucasville cases" and that most of the inconsistencies are "quite insignificant." The Magistrate's characterizations of the evidence Hasan seeks to present may be correct as to the form in which the evidence has thus far been presented. They misstate the substance of this critical evidence, which goes squarely to actual innocence. Brian Eskridge and Aaron Jefferson were members of the Black Gangster Disciples, the gang Lavelle led. Both Eskridge and Jefferson testified that on April 14 Lavelle tried to enlist them in a plan to kill a guard, and that Lavelle ordered Eskridge to be beaten when Eskridge refused. State v. Were II, Tr. at 2043-2048, 2070-2072. During the uprising, Muslim prisoner Sean Davis slept in the living area controlled by Lavelle and the BGD, pod L-1. Davis woke up about 7 a.m. on April 15 and heard Lavelle tell prisoner Stacey Gordon that "he was going to take care of that business." Gordon responded, "[Y]ou go ahead, take care of it . . . . I will come clean it up afterward." State v. Were I, Tr. at 1640-1644. Prisoner Willie Johnson also celled in L-1 during the riot. Around 9 a.m. on April 15 he heard Lavelle tell BGD member Johnny Long to "put on your mask," and Lavelle, Long, and a third man who was already masked, left the pod. State v. Robb, Tr. at 4651; State v. Were I, Tr. at 1762-1764. Later the three men returned to L-1. Lavelle "was like in a frenzy," saying "see how they like me now, see if they think we bullshitting now." State v. Robb, Tr. at 4653; State v. Were I, Tr. at 1764. Prisoners Tyree Parker, Eddie Moss and Sterling Barnes testified that on the morning of April 15 each observed Lavelle and two other prisoners knock on the L-6 door and go in. Soon after, Reggie Williams and three other prisoners came out of L-6 into the corridor. After a few minutes Williams said, "[T]hey should be finished," and Lavelle and his two associates "masked up from head to toe" (Parker) came out. State v. Robb, Tr. at 4503-4512 (Moss); State v. Were I, Tr. at 1686-1688 (Parker) and 1865-1868 (Barnes). Later that day, Willie Johnson and Eddie Moss testified, Were went to L-1 and knocked Lavelle to the ground. Johnson recalled Were saying, "Lavelle, you going to be held responsibility [sic] for what you caused." Moss remembered Were telling Lavelle, "[Y]ou gonna be responsible for that call you just made, man. You didn't have no business making that call." State v. Robb, Tr. at 4525-4528 and 4660-4662; State v. Were I, Tr. at 1783-1784 and 1824-1825. Prisoner Antoine Odom, who celled near Lavelle when Lavelle decided to turn State's evidence, testified about Lavelle's motivation. Q. Tell us what he said. A. He said the prosecutor was sweating him and he had to do what he had to do -- he was gonna cop out cause the prosecutor was sweating him, trying to hit him with a murder charge. . . .
Q. Did he say anything about the story he was going to tell the prosecutor? A. . . . He said he was going to tell them what they wanted to hear. State v. Robb, Tr. at 4853-4855. 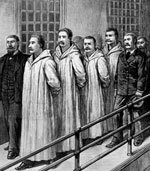 It may be objected that the eight witnesses whose testimony has just been cited were all prisoners. But so were the informants on whose much more inconsistent stories the prosecution relied to convict Hasan and sentence him to death. Hasan's defense should be permitted further discovery concerning all contacts between the prosecution and these eight men, and all statements they may have made during the State's investigation. Several paragraphs of the Supreme Court's statement of facts describe the hands-on murder of Officer Vallandingham. At about 10 a.m. on Thursday April 15, the Court asserts, Hasan and co-defendant James Were were in L-6, where hostage officer Robert Vallandingham was confined. Hasan told Were to wait several minutes, and if he had heard nothing from Hasan to proceed with his "business." Hasan then left L-6. About five minutes later, it is alleged, prisoners Alvin Jones and Darnell Alexander brought Officer Vallandingham to the downstairs shower and there, directed by Were, killed him. Recommendations at 9. These assertions derive from the uncorroborated testimony of a single prisoner informant, Kenneth Law, who has since repudiated his testimony in two extremely detailed and persuasive affidavits. I, Kenneth Law, am making this confession voluntarily to clear my conscience of the injustice I was forced to play a part in because of fear for my life being sacrificed for a crime I did not do nor had knowledge of. This Affidavit is to expose the scandal executed by the Ohio State patrol and the prosecutors involved in the S.O.C.F. riot investigation. Before my first interview with the Ohio State Patrol myself, Sherman Sims and another inmate, whose name I will withhold [Stacey Gordon], talked regularly about regaining our freedom. We knew that information in the Vallandingham murder was the key to the door . . . . The story that Gordon, Law, and Sims concocted in 1994 was the scenario determined to be fact by the Ohio Supreme Court in State v. Sanders. However, Sims and Law experienced what Law describes in his 2000 affidavit as a "falling out." When Sims was indicted for assault early in 1994 he changed his telling of the story in one important detail: he said that it was not Jones and Alexander who murdered the officer, but Jones and Law. On April 27, 1994, the Highway Patrol, without prior notice to Mr. Law, had him surreptitiously removed from the Mansfield prison and brought to the Highway Patrol station. When Mr. Law left the prison, he was told he was being taken to a doctor's appointment. Trooper McGough and Trooper Fleming met Kenneth Law at the Mansfield Highway Patrol station. . . . [Mr. Law] was told he was to be interrogated by the Highway Patrol regarding the events of the riot and C.O. Vallandingham's death. The interrogation began between 9 and 10 a.m. There was conflicting testimony as to whether Law was given Miranda warnings. At 1:22 p.m., approximately four hours later, the officers turned on the tape recorder. "Memorandum in Support of Motion to Suppress," State v. Law, Case No. B9409511 (Hamilton County), at 3-7. On the tape, Law recounted the original story he, Gordon and Sims had fabricated. Case No. 900-1500-93, Tape A-189, Interview 1245 with Troopers R. T. McGough and J. W. Fleming, April 27, 1994. The authorities continued to talk with both Sims and Law. Opening Statement of Prosecutor Breyer, State v. Law, Tr. at 947-953. Choosing to believe Sims rather than Law, they indicted Law for the kidnapping and aggravated murder of Officer Vallandingham. In opening and closing statements, prosecutors told the jury that Law was a hands-on murderer of Officer Vallandingham. [S]hortly after 10:00 in the morning, Hasan, Carlos Sanders, the leader of the Muslims and the leader of this riot, told a group of Muslims in L6, and it was a group which included this gentleman, Kenneth Law, if you do not have a phone call from me, or if we do not get a phone call in the next ten minutes, then you, Kenneth Law, you, James Were, you, Alvin Jones, take care of business. Within minutes Carlos Sanders, left the block, and within minutes after that James Were turned to Kenneth Law and Alvin Jones and told them to proceed. And Kenneth Law and Alvin Jones took that cord and wrapped it around the neck with one man on one end, and one on the other, and they yanked on that cord, and they put a bar bell over his neck until he was dead. Prosecutor's Opening Statement, State v. Law, Tr. at 937 (emphasis added). Kenneth Law is here before you today because the State of Ohio believed it had sufficient evidence to prove to you beyond a reasonable doubt that he was the hands-on killer of Robert Vallandingham on April 15, 1993. . . .
Law . . . was the hands-on killer that was doing as instructed . . . .
Ladies and gentlemen, the credible, believable evidence that you have heard is that Kenneth Law . . . on April 15th, acting at the direction of first Sanders, Hasan, down through Were, that he was given the instructions he was to kill Officer Vallandingham . . . . Prosecutor's Closing Statement, Tr. at l521, 1613, 1619 (emphasis added). In August 1995, the jury convicted Law of kidnapping the officer but hung on the more serious murder charge. In his second affidavit in 2003, Law recounted the whole story including what happened after the jury hung. During the Lucasville riot of 1993, I slept in the cell belonging to James Were in block L-1. Although I was a mid-level Muslim, L-1 was the block that Anthony Lavelle and his Black Gangster Disciples controlled during the riot, and I overheard many of their conversations. On the morning of April 15, 1993, I was in L-1 and heard Anthony Lavelle, Aaron Jefferson, and Tim Williams talking about killing a guard. Lavelle left L-1, along with two others whom I recognized to be Gangster Disciples, despite their masks. A few minutes later, I also left L-1 and went toward L-6. As I approached the door of L-6, the two masked Disciples came out. I entered L-6 and saw Lavelle inside. I looked into the shower and saw Officer Vallandingham dead. It was very clear to me what had just happened: Lavelle and his associates had killed the guard. . . .
After the riot, prosecutors, including Brower, and troopers, including McGough, placed tremendous pressure on me . . . . At one point, I revealed to them that Lavelle had killed Vallandingham. The prosecutor told me that my story would have to change, because Lavelle was a State witness.
. . . I refused to cooperate any further. I went to trial for the Vallandingham murder and the jury hung. The prosecutors increased the pressure on me, and even my own lawyer pressed me to cooperate and avoid a second trial. They made it clear that I would die for something I had not done unless I said what they wanted me to say. I eventually broke, and gave false testimony. To this day, I regret having lied in my statement and on the stand. I do not want to go to the grave with this on my conscience. I am willing and able to testify to the foregoing, if called. The testimony the authorities forced Law to give against Were and Hasan in 1995-1996 was exactly the same story that the authorities had determined to be false a year and a half earlier, so much so that they had put Law on trial for his life. The prosecutor told Hasan's jury that they should not doubt Law's testimony because Law was simply repeating the statement he made to the authorities in April 1994. Q. [I]n return for you pleading guilty to conspiracy to commit murder and receiving a sentence of 7 to 25 concurrent, what were you supposed to do for the State of Ohio? A. Testify against three of the . . . alleged co-defendants in my case. Q. Which co-defendants were they? A. Siddique Hasan, James Were . . . and Alvin Jones. Q. And you testified in the case of the State of Ohio versus James Were? Q. And you're here today to testify in the case of State of Ohio versus Hasan, is that correct? Q. Now was there an agreement in regards to what you were supposed to testify to? A. The truth of the statement that I originally made. Q. You made a statement to the State Patrol at some time prior, is that correct? Q. And you're supposed to tell us basically what you told us in that statement, is that correct? Q. And what's to happen if you don't testify consistently to the statements that you've already made to the State Patrol? A. The original charge can be reinstated with death specifications. Tr. at 2301-2302 (emphasis added). What the prosecutor failed to tell the jury is that the State considered this statement to be false. Law's testimony at the Were and Hasan trials must be rejected not only because he himself has recanted it, but also because, first, it is contradicted by the medical examiner's testimony, and second, the State's chief investigator stated shortly before Hasan's trial that it continued to be the State's position that Law's statement of April 1994 was, in part, not true. a bar, a weight bar over [Officer Vallandingham's] neck and both of them stood on both ends of it. Jones held onto the bars to balance himself on the bar, and Alexander was in the doorway and was holding onto the doorway standing on it, pressing down on the officer's neck. Tr. at 2354. Law elaborated on cross examination. Q. Now you indicated that they stood on that bar to sort of press it down on the front of his throat? A. Yes, something like a seesaw manner, both of them pressing down and standing on him. Law failed polygraph. Law took himself out of the act [of murdering Officer Vallandingham] & replaced himself with inmate Darnell Alexander. Testimony at Rules Infraction Board, Jan. 18, 1996. Thus when the prosecution presented Law as a witness in the subsequent State v. Sanders trial to testify as he had at the Rules Infraction Board hearing for Alvin Jones, that Jones and Alexander had killed Officer Vallandingham and that the killers rocked back and forth on a weight bar placed on Vallandingham's neck, the prosecution presented evidence that it knew or should have known to be false. In House v. Bell, -- U.S. -- , 126 S.Ct. 2064 (2006), the United States Supreme Court held that compelling evidence of actual innocence may be presented to a federal court at any procedural stage prior to execution. [I]t is established that a conviction obtained through false evidence, known to be such by representatives of the State, must fall under the Fourteenth Amendment. . . . The same result obtains when the State, although not soliciting false evidence, allows it go uncorrected when it appears. The knowing use of perjured testimony, including the failure to correct false testimony, constitutes a denial of due process if there is any reasonable likelihood that the false testimony could have affected the judgment of the jury. [Citations omitted.] This claims encompasses use of testimony, whether elicited or left uncorrected, that the prosecutor knows or should know is false. See to the same effect Stumpf v. Mitchell, 367 F.3d 594, 619 (6th Cir. 2004), Boggs, Chief J., dissenting ("Knowingly putting on false evidence is prosecutorial misconduct that violates the due process clause"). Applying this clearly established law to the facts elaborated above, prosecutors in State v. Sanders appear to have violated Napue v. Illinois in presenting evidence by Kenneth Law that they believed to be false. At the very least, counsel for Hasan should be permitted further discovery. Should the federal courts conclude that Napue was violated, both Hasan's conviction and Hasan's death sentence would have to be reversed. All documentation concerning all contacts between Kenneth Law and the authorities should be made available. The Magistrate's Recommendations should be denied, and Hasan's habeas petition should be remanded to the Magistrate for further discovery and an evidentiary hearing. 1 The Lucasville Five were convicted of kidnapping as well as murder. Under Ohio law, it is apparently "kidnapping" to bring blankets, food, and medicine to a hostage correctional officer, and you can be sentenced for up to 25 years in prison for each alleged kidnapping. I am going to concentrate on Hasan's murder conviction because it resulted in a death sentence. 2 The Antiterrorism and Effective Death Penalty Act provides that habeas relief shall not be granted on a claim unless "the adjudication of the claim . . . resulted in a decision that was based on an unreasonable determination of the facts in light of the evidence presented in the State court proceeding." 28 U.S.C. Section 2254(d)(2) (emphasis added). The Act also provides that a State court's determination of a factual issue shall be presumed to be correct unless the petitioner succeeds in "rebutting the presumption of correctness by clear and convincing evidence." 28 U.S.C. Section 2254(e)(1) (emphasis added). 3 The Recommendation inserts an elipsis prior to the last paragraph of its factual recitation. The elipsis corresponds to the paragraph in the decision of the Ohio Supreme Court concerning the murder of Bruce Harris. The jury acquitted Hasan of this charge. State v. Sanders, 92 Ohio St.3d at 248. 4 Ohio Revised Code Section 2923.03(D) states: "[T]he admitted or claimed complicity of a witness may affect his credibility and make his testimony subject to grave suspicion, and require that it be weighed with great caution. . . ." See also Dodd v. State, 993 P.2d 778, 783 (Okla. 2000) ("Courts should be exceedingly leary of jailhouse informants, especially if there is a hint that the informant received some sort of a benefit for his or her testimony"); McNeal v. Mississippi, 551 S.2d 151 (Miss. 1989) ("The testimony of jailhouse informants, or 'snitches,' is becoming an increasing problem"). 5 State v. Skatzes, Ex. 296A. Burchett: All right. Thanks, George. Skatzes: All right. Say a prayer for us. State v. Skatzes, Exhibit 296A at 32. At Skatzes' trial, chief State investigator Howard Hudson conceded that Skatzes and Burchett ended April 14 "on the verge" of the release of two hostages and in "elevated spirits." State v. Skatzes, Tr. at 2158. 7 Seven years later, at the second trial of fellow Muslim Namir Abdul Mateen a.k.a. James Were, Williams testified again that the Muslims' plan was to occupy a single living area or "pod," L-6, so as "to get someone from central office to come down and address our concerns." State v. Were II, Tr. at 1645. 8 According to the tape itself and all versions of the transcript prepared from the tape, the meeting was chaired by Stanley Cummings. As to Hasan's participation, at James Were's second trial Sergeant Hudson was asked to identify the prisoners whose voices could be heard on Tunnel Tape 61. He named Were, Anthony Lavelle, Jason Robb, Stanley Cumminds, Rodger Snodgrass, George Skatzes, Cecil Allen, and Johnny Roper. "I believe that's everybody that is on Tape Number 61," Hudson said. State v. Were II, Tr. at 1370-1373. 9 Lavelle testified to the same effect in State v. Were I, Tr. at 1238 ("Q. When you left the meeting, was that the understanding, that a guard was going to be killed? A. No. . . [W]e was going to meet up later on this afternoon . . . and take the final vote"), and State v. Skatzes, Tr. at 3909, 4066-4067, 4098-4099. 10 In addition, there are signed affidavits by Wayne Flannigan, a member of the BGD ("Lavelle .. . told AJ to kill a guard"); by Greg Durkin ("I . . . saw Lavelle and the two masked inmates come out of L-6. Lavelle was laughing. He later said that he had taken care of business"); and by the late Roy Donald ("Lavelle told me that Gordon had given him the okay to kill a guard and that he took care of his business"). See Lynd, Lucasville, at 65, 68. 11 If one adds the three prisoners whose affidavits are cited in n. 10 (Flannigan, Durkin and Donald), and prisoner Kenneth Law, whose detailed affidavits are quoted below, twelve (12) witnesses have presented under oath facts leading them to believe that Anthony Lavelle was responsible for the murder of Officer Vallandingham. 12 The prosecution knew that Law's testimony about a weight bar would be contra-dicted by Dr. Fardal. Dr. Fardal had previously testified, on direct examination, that Officer Vallandingham's injuries were not consistent with a belief that an object such as a weight bar had been placed on the officer's neck by men on either side pushing or standing on the bar. State v. Skatzes, Tr. at 4870-4871.